Tanzanian Minister of Foreign Affairs and International Cooperation Bernard Member plans to meet with foreign ministers of the Nile Basin countries in July to discuss amendments to the Entebbe Agreement over the allocation of Nile water, the minister announced in a Wednesday statement. He added that discussions would take into account the importance of the Nile water in meeting the economic needs of Egypt. Egyptian foreign ministry spokesman Badr Abdelatty said in a press release that Egypt considers Tanzania’s proposal an important step to protect the interests of all Nile Basin countries and enable them to achieve the maximum benefit of the Nile River. According to Abdelatty, the issue of the dam currently being built in Ethiopia will not be discussed “directly”, but rather within the framework of the Entebbe Agreement. Abdelatty added that the Tanzanian initiative reflects the understanding of the Nile Basin countries regarding the importance of the Nile to Egyptians, due to the unavailability of an alternative source of water. The Entebbe Agreement, signed in February 2011, includes Uganda, Kenya, Tanzania, Ethiopia, Rwanda, South Sudan and Burundi, and would increase the share of Nile water for these countries at the expense of downstream countries. Egypt did not sign the agreement, as Mohamed Bahaa ElDin, Minister of Water Resources and Irrigation at the time, said that it was not “suitable for downstream countries” and was “against the interests of Egypt and Sudan”. 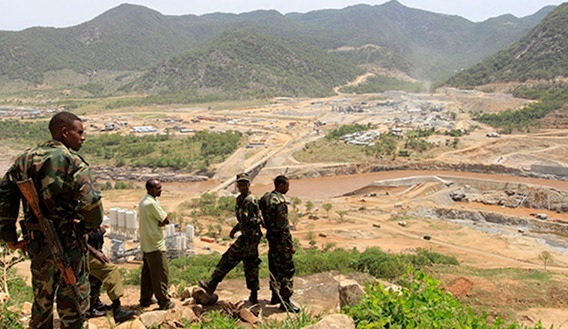 Ethiopia is building the Great Renaissance Dam 24 hours a day and with full vigor even though Egypt is doing all in its power to slow down the building process using its diplomatic influence around the world. Ethiopia is doing all it can to equalize the Egyptian diplomatic pressure but is it enough? Many scholars from Ethiopia are supporting Ethiopia’s case 100% but some are itching towards becoming an Egyptian foot soldier. We are sure, lately, you have read many articles that support Ethiopia’s case as well as Egypt’s case. The question we have for you is can anyone be considered an Ethiopian let alone a nationalist Ethiopian if he/she is in bed with Egypt when it comes to the building of the Hedase Dam? Also, what do you think about those scholars who want to support the building of the Hedase dam but wants first to bash the great leader Meles Zenawi? How could you help such characters to have a courage and join the transformation campaign that is underway to change the society and country for the better with no ifs and buts? In what language can we tell them all that it is Meles’s Ethiopia they are starting to feel good about these days- the Ethiopia that has increased life expectancy from 44 to 64 years , the Ethiopia that has halved poverty since 1991 and the Ethiopia that has managed an average of 10% growth for almost 10 years! Which aspect of Meles’s achievement do these people hate so much that only an “Oxford/Harvard” taught person can only see but not a MaiQental educated person can see. We understand the university of Maryland argument well(read here)! But why can’t the people who lives and works in Maiqental,- so to speak, see what Meles has done wrong but a Diaspora living 10000 miles away “can”. Does it make sense? We understand those that have chosen to be a foot soldier for Egypt as well as the one man regime in Asmara cannot be a nationalist Ethiopian but what about those that have hard time to admit PM Meles and his government greatness despite acknowledging the achievements made so far? What is their problem? Have Your Say!